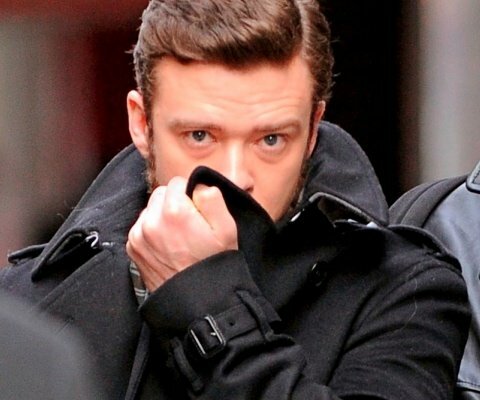 Shooting a movie on the streets of New York is never an easy task, but that goes double when you're working with stars on the level of Carey Mulligan and Justin Timberlake, both of whom were bundled up yesterday in Manhattan to shoot Inside Lllewyn Davis. They're probably the starriest names in the cast, but Oscar Isaac is actually playing the lead of the new Coen Brothers movie, playing a Bob Dylan-esque folk singer making his way through the Greenwich Village music scene in the 1960s. We already got a look at the set itself, but now check out Mulligan and Timberlake in their own period appropriate costumes, via Just Jared. Though Isaac is the one playing the title characters, Timberlake's character is apparently pretty big as well, another folk musician named Jim who somehow gets involved in Llewyn Davis's life. Mulligan play's Jean, Jim's wife, and though it's hard to know how big that part will be in what's presumably a boy-focused movie, Mulligan tends to make a lot out of pretty much any supporting role she's given. Both of them are looking the 60s part in these photos, though I especially like Timberlake's sideburns and swept-back hair-- call me crazy, but he's got a Wolverine kind of thing going on, and it looks good on him. Especially given the strange recent news that Llewyn Davis might be a screwball comedy, we're really looking forward to seeing what the Coens have in store when this movie makes it to theaters-- which, if we're lucky, will be later this year.